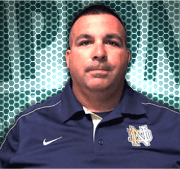 I had a nice chat the other day with Nick Garcia, the throws coach at Notre Dame High School in Sherman Oaks, California. Nick is going to present at the 2019 ITCCCA Clinic, and I wanted to get an idea of what coaches could expect from him. It turns out that he is going to focus on an aspect of throws coaching that some of us find fascinating, others find intimidating, and still others view as hopelessly inscrutable: creating a training plan for our athletes. Whether creating a plan is something you relish or fear, I think you’ll get a lot out of Nick’s presentations. In his first session, he is going to explain how to create a fourteen-week training plan based on a traditional periodization model. He will detail the lifts (including sets and reps) jumps, and speed exercises that he would recommend to help your athletes hit a peak at the end of this cycle. His second session will focus on the Bondarchuk system and how it can be applied to high school throwers. Antoliy Bondarchuk won a gold medal in the hammer for the Soviet Union at the 1976 Olympics. He later became a coach and developed a training system that helped Canadian shot putter Dylan Armstrong win bronze at the 2008 Olympics. In Nick’s final session he will demonstrate the various exercises he recommends for throwers. Come dressed to move for this segment, as you will have a chance to get up and try things out. Nicks’s presentations will perfectly compliment those of Ryan Whiting, who will focus on shot and discus technique. Together, they will make the 2019 ITCCCA Clinic a great opportunity for throws coaches.